After a few days at work, it was good to get back out on the water and yank on some fish. I started the day chasing deep water perch. They were schooled up following weed edges in 25’+. Most of the fish I caught were in 31 FOW and aggressive. It didn’t seem to matter how you worked your jig. If there was a fish, it bit! At times I had schools 10 feet thick! The only think that spooked them was cutting holes. It didn’t take long to realize that cutting one hole at a time was the way to go. Pretty good way to start the morning! After the perch shut off around 9:30, I headed to some nearby weeds and started looking for the bluegill. In the mix I also found some pumpkinseed,pickerel, and largemouth. The fish were cruising above the weeds all day which was strange. Usually they hunker down for the mid part of the day and make me work for them! 1-29-14 – One More Day! Work for the week starts tomorrow but that is still plenty of time for a great day trip with a few buddies. We took our time getting on the ice because of the limited afternoon bite yesterday and the lack of sleep from last nights trout trip. This move worked out in our favor. Not only did we eat a good breakfast but the fish were just starting to bite when we got going. For 4 hours, I sat in one hole with constant action the entire time. I was fishing in 5.8 feet of water but never went more than 3 feet down. The majority of the fish I caught were within 2 feet of the surface. 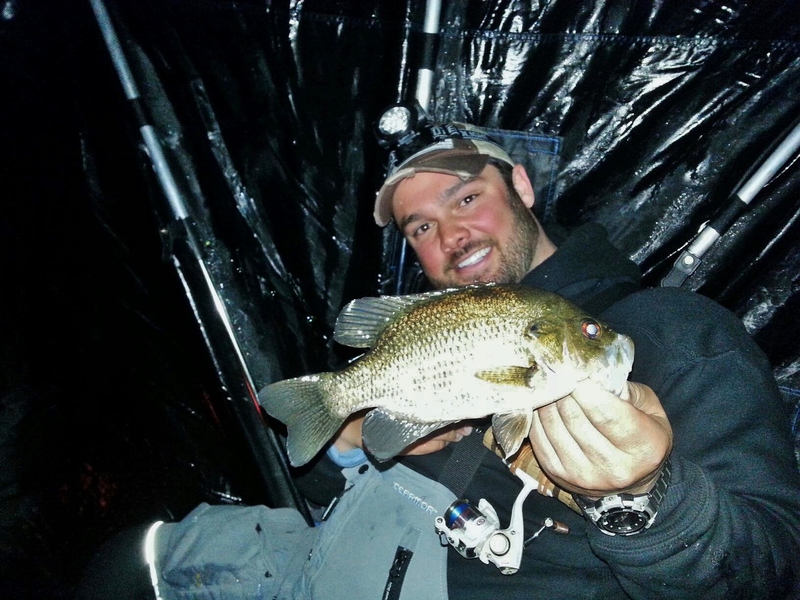 The larger crappie were within only inches of the surface. I was running a gold Drop Jig from Clam Pro Tackle with a pink Jamei from Maki Plastics and the fish were inhaling it. While the bluegill came in and closely inspected it, the crappie just swam right through without blinking. It was pretty exciting. I ended up heading home with a limit of crappie and some great memories shared with friends. Sunday seems so far away! The day began around 8 am. We knew that the fish were around because they bit yesterday but the odds of them sitting still overnight is slim to none. Starting out our search in the productive holes from the day before, it didn’t take long to realize that they had moved. We checked a few other locations that they had bit in recently with no real success. Starting to parallel the shoreline working through the weedbed seemed like the best odds of getting on them rather than waiting. Shortly after our search began, we found them. The gills were biting well and the crappie bit as they moved through. With a chilly temperature and a breeze in the air, I was fortunate enough to find a nice opening in the dense milfoil patch that I could set up my shack over. For the remainder of the day, I sat in that same hole picking at the fish as they moved through. The water was clear enough to see the fish move in and I was able to see how they wanted it moved. 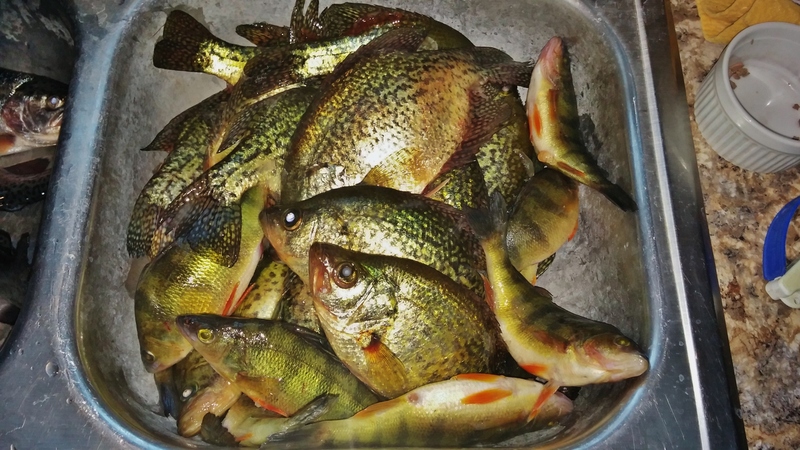 There was a steady stream of bluegill and I ended up releasing 45 crappie that were about 9″. 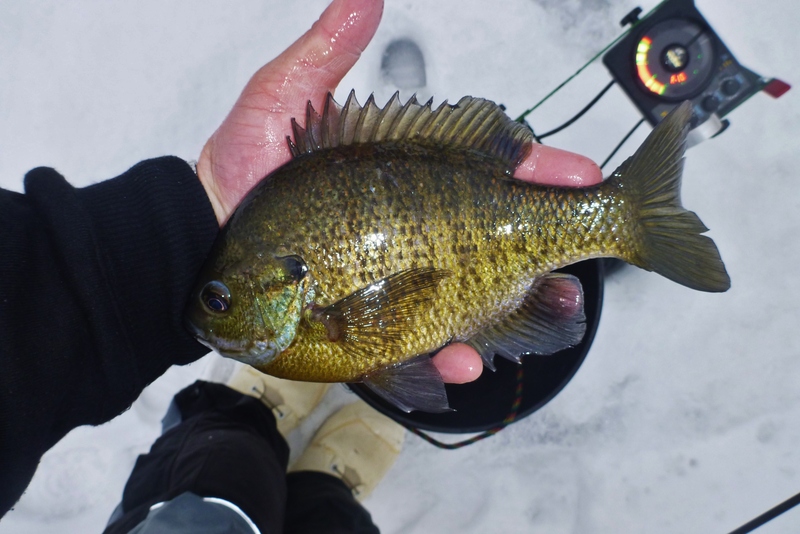 Many of the larger crappie that I saw were cruising right under the ice and weren’t too interesting in my presentation. 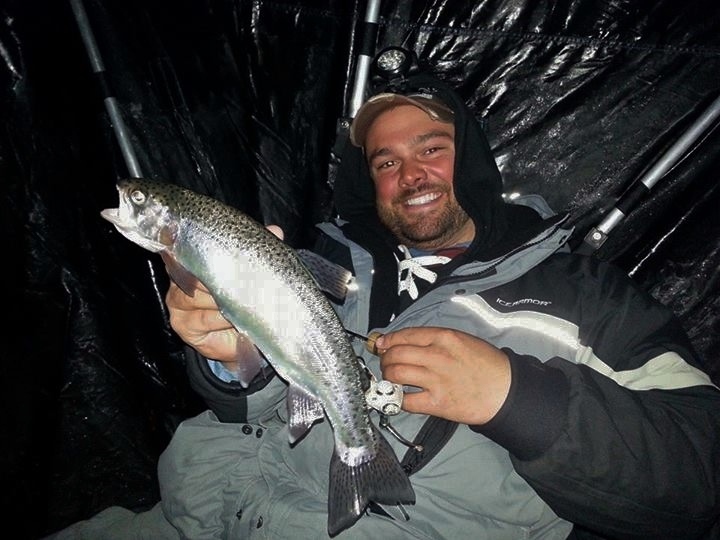 We left the ice with enough time to get to the bait shop for minnows as we had intentions of a nighttime trout bite! 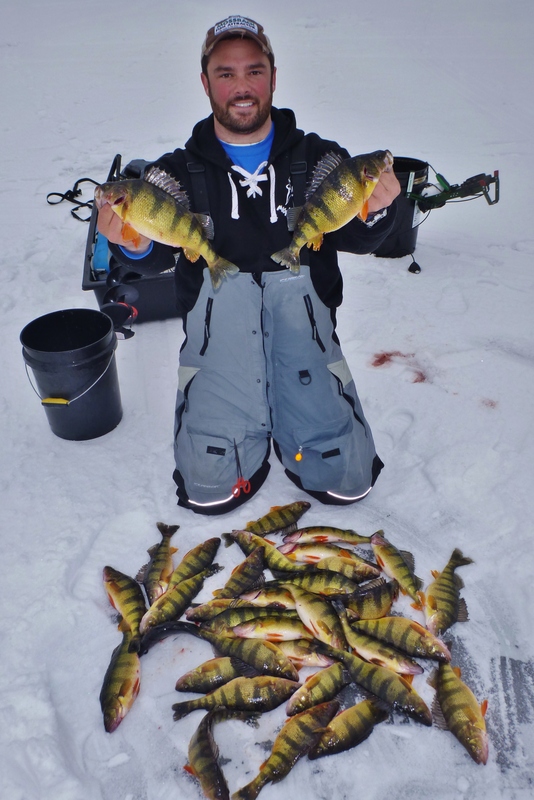 I ended up taking a few crappie and perch home for a meal on the ice tomorrow! 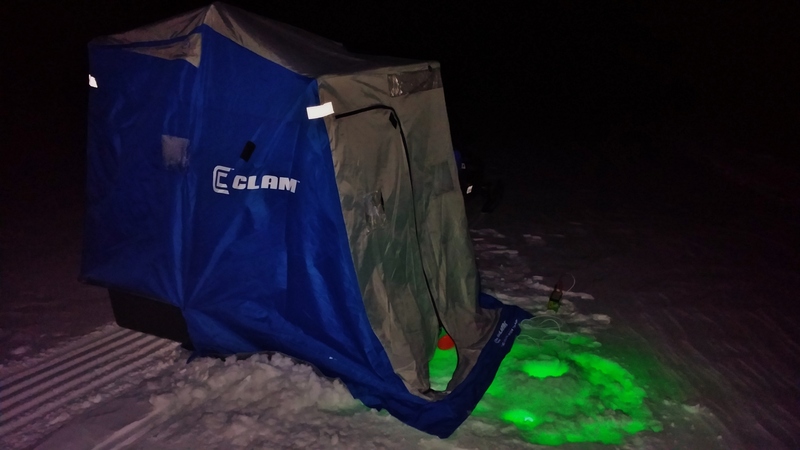 With hopes of a night bite, we packed up the two man Clam flipover, a vexilar, minnows, heater, and a Hydro Glow Fishing Light. We targeted mid lake humps and sharp breaks near shore. The mid lake humps seemed to hold the most fish so we stuck with it until heading for home. 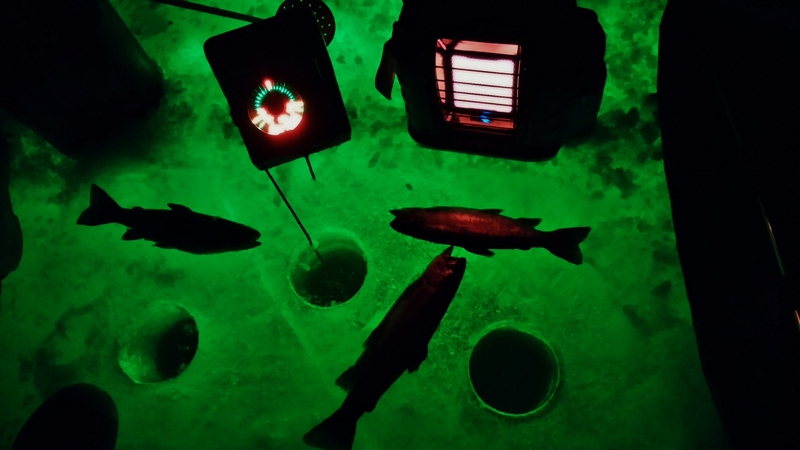 While these lights are killers on this body of water during the summer months, we had no idea how the trout would react in the winter. On our best set up, we were perched over 18 feet of water with a sandy bottom. Paralleling us to the front was a lengthy sandbar with deep water at our backs. We mainly worked the bottom 6 feet of the water column but when a fish flashed above we reeled up and tried to work them. Most of the trout came cruising 6-10′ off the bottom but one was picked right off the bottom in the mix with the crappie and rockbass. All night long we ran gold tungsten jigs from the Clam Pro Tackle Line. It didn’t seem to matter what style jig was tied on as long as it was gold. A very steady but slow jigging action seemed to trigger the most strikes. As the clock neared 1am the fishing had slowed significantly and we decided that it was time to pack it in so we could get home and do it all again tomorrow! It was a tough day on the water. We decided to take a chance and check out some bays that haven’t had much for a bite yet this year. Knowing that we might get skunked due to a lack of fish. we knew there was a chance that we might find something good! We ended up catching fish but not in great numbers. The bite was sporadic at best but we certainly earned the bites we got! Many of the spots we wanted to try were open to the wind. On the positive side we are now armed with some good weedbeds that will eventually hold fish and also learned what our limits are as far as wind goes. 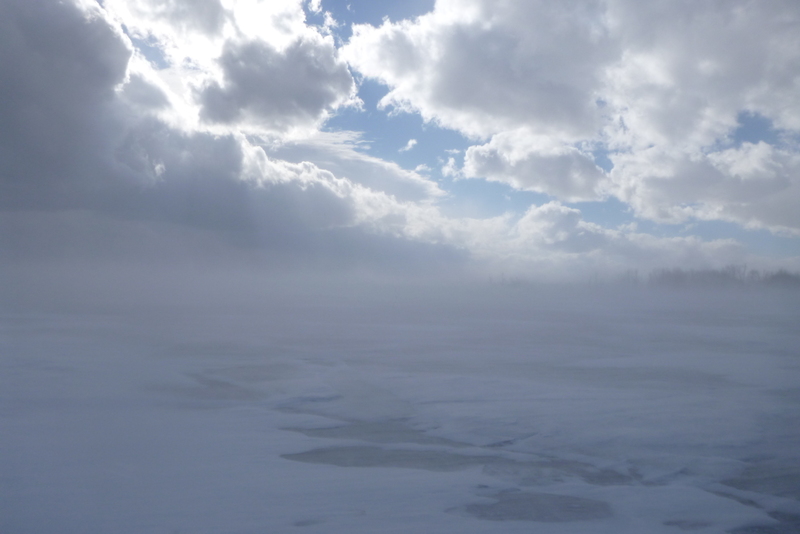 Check out Serious Wind On Lake Champlain for some action! 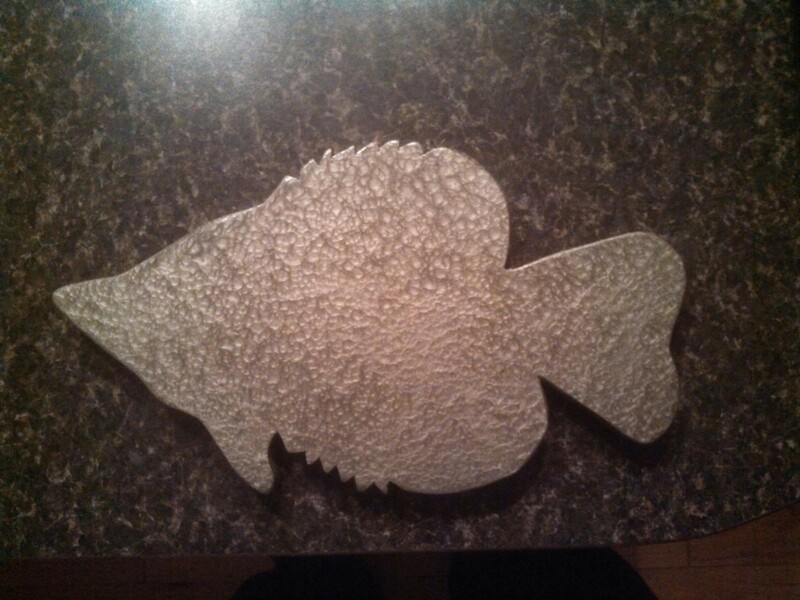 1-26-14 – Gills Are Back! 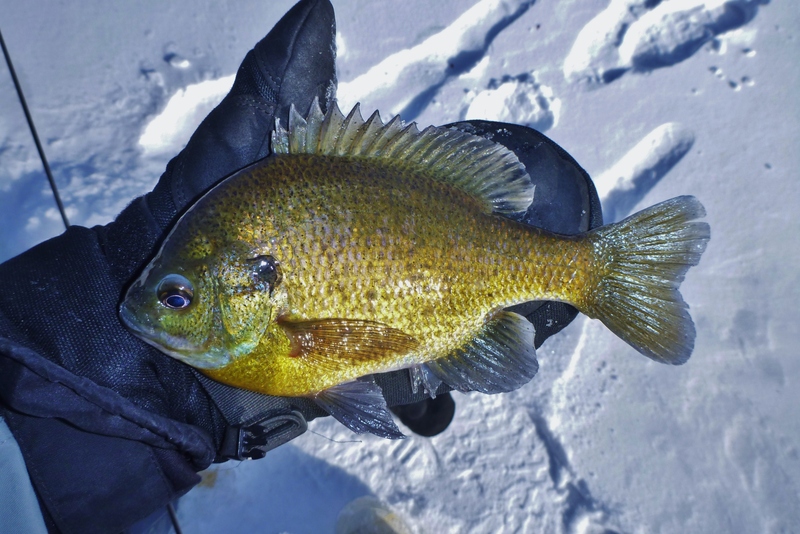 While many local lakes holed quality bluegills in shallow waters year round, some of my favorites don’t. 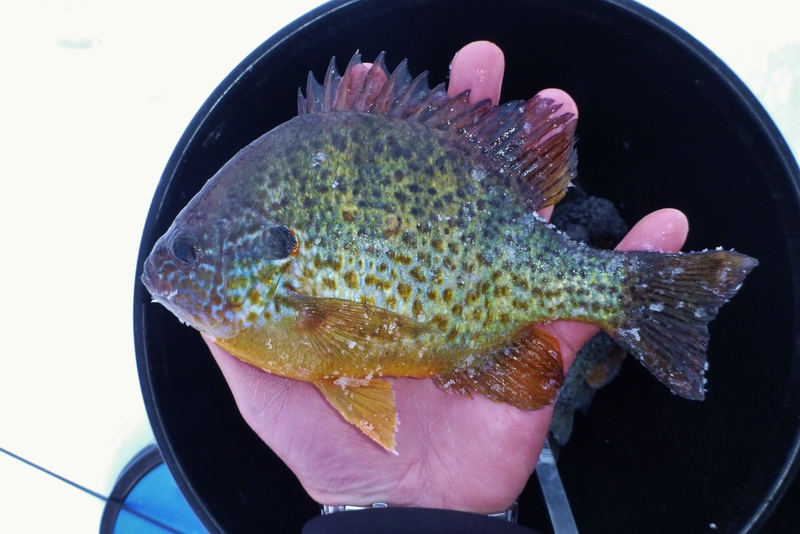 Finding them in the summer is relatively easy with a boat and good electronics but winter is another story. They tend to be on the move every day but when they move in the bite can be hot! Looking back at past years, the bite would be a little early but with this wacky winter it was worth a shot! With another cold day in store, I wasn’t in a rush to get on the water too early. I slept in and was on the water shortly after 10am. I had the lake to myself until my buddy showed up. The wind was suppose to be out of the west so I selected a corner where I would be sheltered. As I got fishing, there was plenty of fish around and they were willing to bite. Unfortunately, the wind was highly variable switching almost constantly throughout the day. South, North, East, and West. It came from all directions. We fished until almost dark with a steady bite right through. 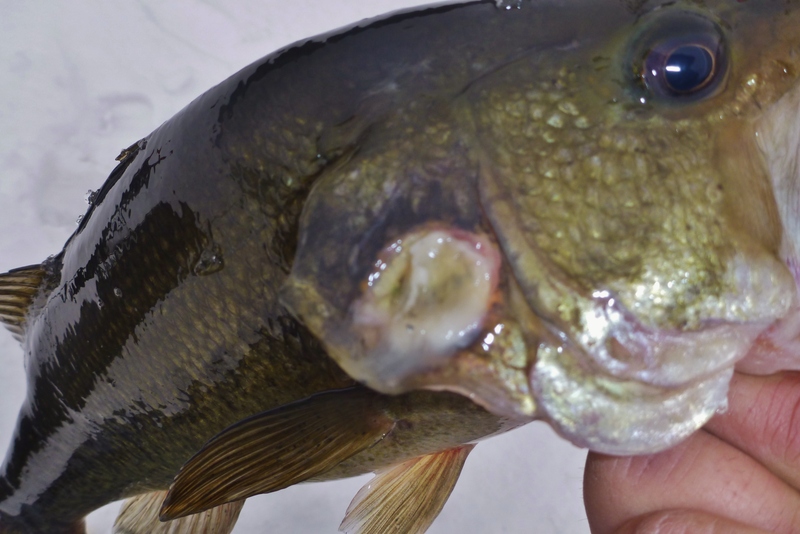 While most of the fish we caught were bluegill and pumpkinseed, the number of bass and pickerel around was sickening! I hooked and landed quite a few but only broke off once with a pickerel in the hole. 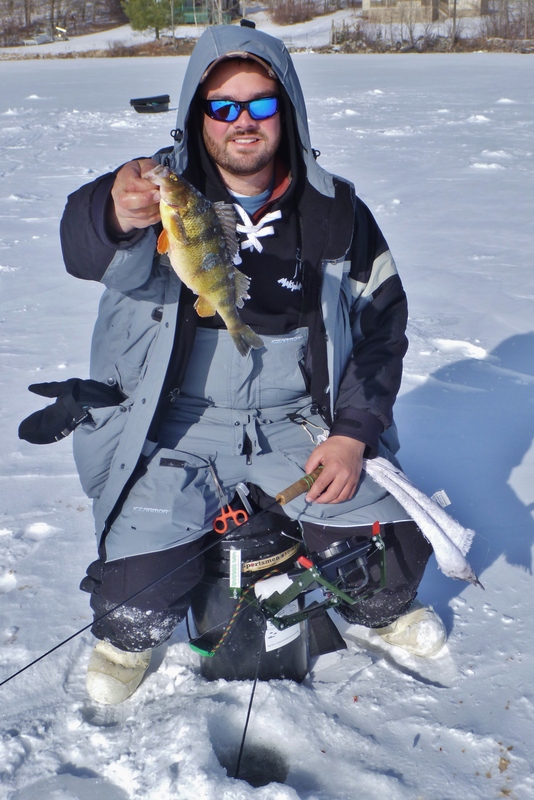 As a bonus, I pulled one nice perch which I rarely see in this body of water! Champlain bound tomorrow! On the ice at 6, the mile walk to the GPS coordinate was a cold one with wind in the face. By the end of the trek, It was quite warm! It didn’t take long to find fish but the bite didn’t really pick up until later in the day. We both spent the entire day in one area because of the fish that were there yesterday. Bobby had the plan to sit in one hole as soon as he caught a crappie but I didn’t think I could do that. While we spent about an hour trying to get on some crappie, I watched Bobby’s first one come up. I also saw him pop the hook and go up to his elbow trying to make the scoop. With no luck and a wet arm, he grabbed his shack and was hidden behind is blue wall for almost the remainder of the day. He was quiet so I knew he was onto something. I worked round and round but most of my crappie all came within a few minutes of each other. Towards noon, everyone cleared out and the bite picked up. Most holes held a crappie or two but it took a few minutes for them to replenish. Having a 20 yard circle of productive holes, a few of us pulled fish little by little. At the weigh in, the majority of people came in with their limit of 6 fish. 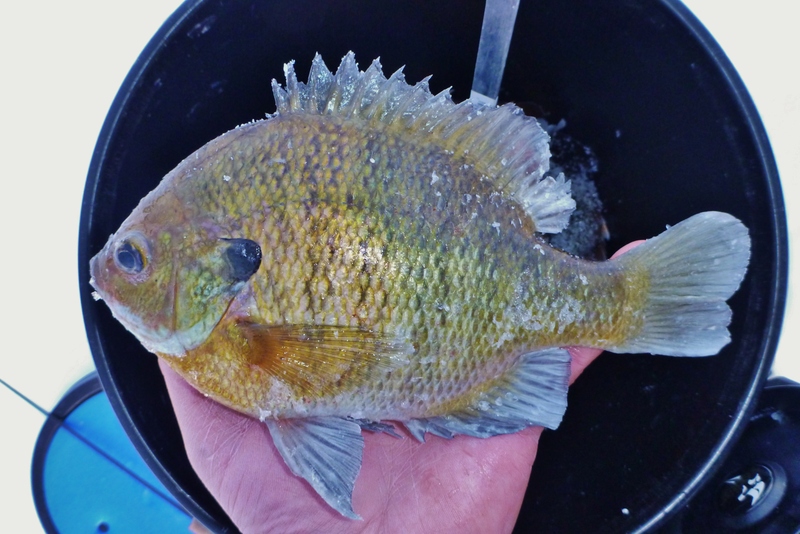 There were lots of nice crappie but the gills and perch, as expected, were on the smaller side. Bobby took 3rd with a weight of 3.65 pounds and I finished 25 with a weight of 2.92 pounds. After two tournaments, overall Bobby is in 3rd place and I am in 6th. Good start for us to the season so far! NationalProStaff.com – Better Than Average.